It's been just over a month since we moved into our new space and we thought we'd give you a tour of our new office. Directly visible and accessible from the showroom and entry, our open offices are an integral part of the display and have been designed to give customers a view of the products in full use. The original warehouse feel was maintained by keeping the space open and leaving the wooden ceiling beams and steel beams exposed. Highly customisable, the Benchwork Spine system paired with Miro S chairs was the perfect solution to respond to the constraints of the building and the needs of the staff, allowing for easy communication and collaboration. Sleek and modern, the white Benchwork legs brighten up the office. A meeting table is replacing one of the desk modules for impromptu meetings and team work. The pull-out drawers Spine units themselves provide ample storage for each employee. We decided to take advantage of existing structural steel posts to run our power and data cables through. The clever Spine unit cable channel means that all cables are fully concealed from the ceiling to all desks, keeping the space visually clean. Our custom joinery capabilities allowed us to create a unique bench-storage unit that perfectly integrates with the Spine system, cleverly designed to also disguise power cables. Privacy was given to each staff member by using Trak Acoustic Environmental Panels and the outdoor brought in with the Trak Planter Box between each workstation. 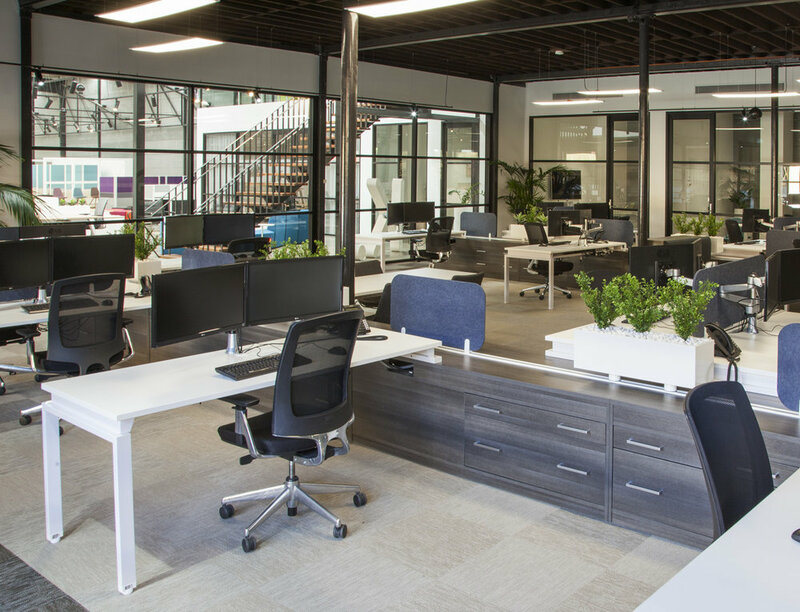 Various quiet offices and meeting rooms, featuring our Lift S height adjustable desks and tables, were also integrated within the office space giving employees somewhere quiet and private to perform work requiring concentration or simply to take a break from the open office. From open offices to quiet rooms, all types of work have been taken into consideration for optimised working conditions. Enquire online or visit us in Mascot for all your office furniture needs. We'll find the right solution for you.